When we told people in Canada (those who know about wine) what part of Australia we were going to, most had no idea where the Riverina was located. It is actually a distinct wine region, but not a famous one. Outside of Aus, the best known regions are probably McLaren Vale, Barossa, Margaret River, and maybe the Hunter, Clare and Eden Valleys. 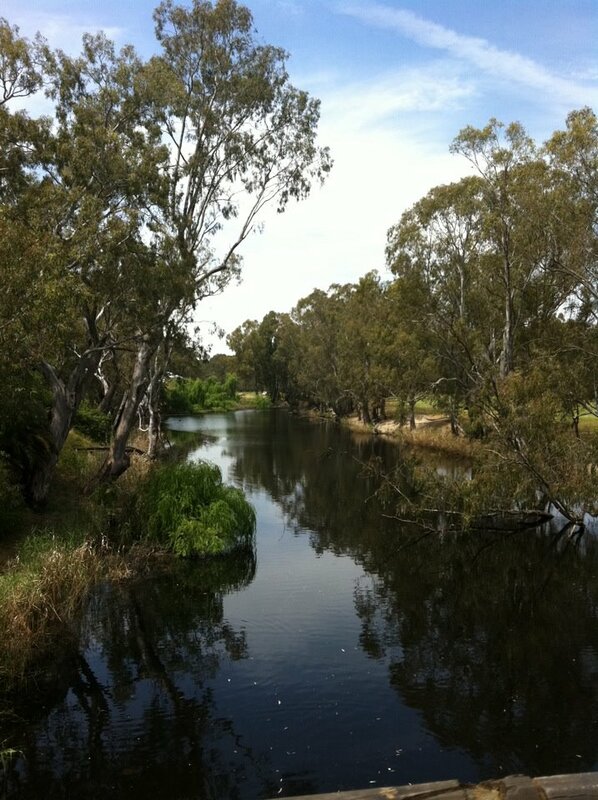 Riverina, though there are some good wines made here, is really a place to grow grapes for goon. Other local areas include the hilltops (around Young…Clonakilla Hilltops Shiraz is wonderful! ), the central tablelands (near Canberra…the Clonakilla Canberra Shiraz is out of our price range!) and Cowra (a small town that actually has its own microclimate and is designated as a wine region; there are some really good wines from there, such as Pig in the House Shiraz). Most of these, however, are quite unknown outside of this area. Our first visit to a regional winery was a mothballed Lindeman's winery, now owned by the people we were visiting. 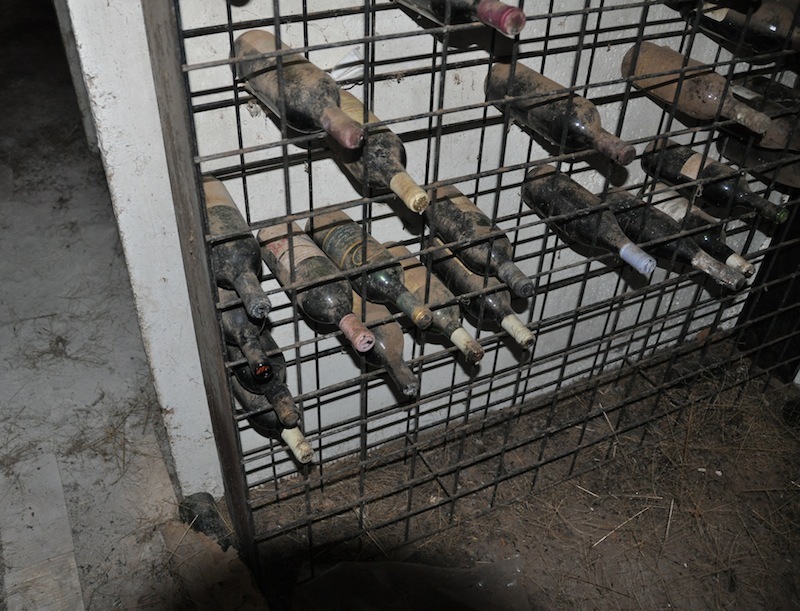 The vineyards are now pasture, and the wineshed houses farm equipment. But in a far corner is a storehouse of local wines from the 1980s...the Australian heat hasn't been good to it. We actually opened two bottles, both of which were horrible. These may have been Chris Pfeiffer's own stock. But, when we said to wine people that we were going to be living a 2-hour drive from Rutherglen, their eyes would light up. Because, for those in the wine know, Rutherglen is a gem. But, now that we have been there, we’re not sure if even the oenophiles know just how spectacular Rutherglen is – unless they’ve been here, of course. While in Edmonton, we drank a bit of wine from Rutherglen (which is a pretty small town). 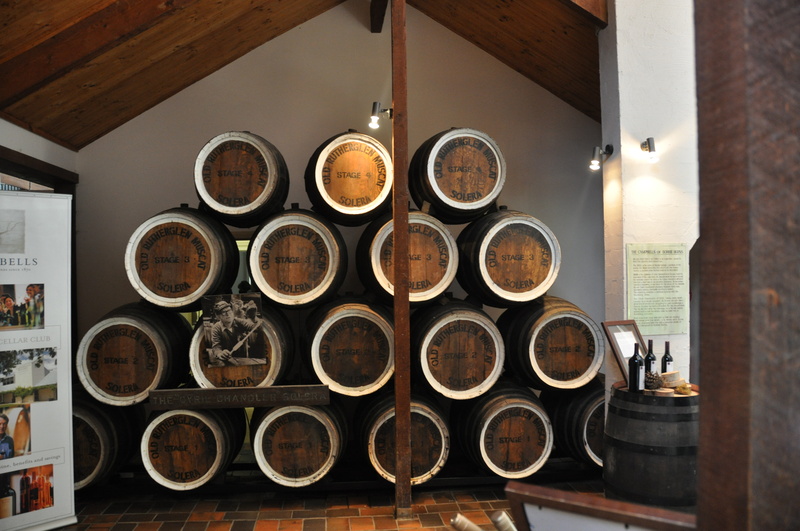 Not much though, because it’s most famous for its “stickies” – thick, sweet, succulent, yummy dessert wines, mostly muscats – so that’s what we tried. The hot temperatures in the region are ideal for growing muscat and other grapes used to produce fortified wines. We had some pretty great ones in Canada, from Chambers Rosewood and Bullers. And since we’ve been here, we’ve also tried others (Stanton & Killeen, for example). The Murray River is the border between New South Wales and Victoria; Corowa, where we were last weekend, is on the north (NSW) side of the river. Rutherglen is about 10 km south of the river, in Victoria. So when we were visiting the Corowa region last weekend, we had to go. And we were quite enlightened by what we found on our Sunday morning jaunt to some cellar doors (the term they use here for where you can sample and purchase at the wineries). Unfortunately, it was pretty windy and threatening rain; so Dan and TP’s plan to bike it (while Lisa and LCP drove, filling the boot with purchases) was shelved. We all piled into the car and headed to the wineries. Wines at Cofields. Note that in the bottom left corner there is a kid's desk. Wineries in Australia are family affairs. How civil! First stop was Cofields winery. It isn’t actually in Rutherglen, but Wahgunyah, a pretty much non-existent town just across the old bridge out of Corowa (as opposed to the new bridge…that would lead to All Saints winery). Dan sampled a few wines, being very selectively restrained actually, as it was only about 10:15 in the morning. There were a couple he thought were worth Lisa trying too. Their Marsanne Viognier blend was quite nice, and they also made a good Durif (Australian name for Petite Sirah). We bought a few bottles and joined their wine club – so now, they will ship us a case of assorted goodies every 6 months. And for good will, as we were leaving (well, when Dan finally noticed that Lisa and all were already gone) the cellar door guy handed over a Cabernet Sauvignon, on the house. As a Pfeiffer club member, we get a discount on picnic hampers...anyone want to join us for a Sunday afternoon lunch here? Award winning wines, turtles (they even supply food) and platypusses (platypi?). We didn't see the latter, but they are there. Then, it was a quick trip down the road to Pfeiffer’s, still in Wahgunyah. Chris Pfeiffer used to work for Lindeman’s, one of the big Aussie wine companies, but went out on his own. Now, his daughter Jen is taking over, and winning tons of awards, including Young Winemaker of the Year for 2011, and her wines are also cleaning up at competitions both here and abroad. Since it was by now almost 11 am, it was OK to sample more broadly. We ran through most of their range, skipping out on the sparkling wines and a few of the others, but tasting their delicious Pinot Noirs, Shirazes and a few whites. And some stickies. Oh yeah, Rutherglen stickies. As we’ve already said, Rutherglen area is known for stickies. Outside of Australia this typically includes ports, muscats, late harvest whites, and maybe dessert wines made from botrytis-affected varietals normally used for table wines (like Semillon or Riesling). But at Pfeiffer we tried a couple of Topaques, and damn were they good! Topaques are (OK, we might not be 100% accurate here!) a cross between a bunch of different dessert-wine styles: botrytis-affected Muscatelle grapes, made into a fortified wine. So, double yummy sweetness and complexity. Wow. The name was actually coined by Chris Pfeiffer, after the European wine control people told Rutherglen winemakers that they couldn’t use Tokay/Tokaji anymore, because that name was trademarked in Hungary. So the Victorians came up with Topaque because the resulting wine is topaz in colour and opaque. And, did we say this yet: delicious. OK, let’s say it again: DELICIOUS. Google Topaque (or lmgtfy) and you will get the whole history and a bunch of stuff about how it is Rutherglen’s hidden gem. We won’t even attempt to describe it – if you like wine, try to track some down. If you like dessert wine, come here…we can take you to the source(s) where you can try more different ones than you imagined. This solera system in the Campbell's cellar door is, we think, still in operation. Wine geeks will understand it...anyone else, come on down and have the winemaker explain it. Then, after Lisa, TP, and LCP went off to look at turtles (the winery folks will even give you food to feed the turtles, too – something to keep the kids busy!) while Dan played wine geek, we finally left Pfieffers with another case and another club membership. And then into Rutherglen proper, to Campbells. Campbells is a bit more slick – their cellar door obviously cost them a lot more than either of the other places had spent. But just because they are good marketers doesn’t mean they aren’t also good winemakers. We had tried a few of their whites before (found them baking in a little drive-through liquor store in Wangaratta). They make wines that are a bit unusual for Australia, such as Trebbiano and Gewurztraminer. Both of these are really good, especially the Trebbiano. This region and the King Valley (which we will post about next year…we’re going there for a holiday) have people experimenting with lesser-known varietals, often Italian, and quite successfully making a fantastic alternative to the better-known Shiraz, Cab Sauv (Aussie say Cab Sav…not understanding the French origin), and Chardonnay that are common in Australia. Jones don't make wine with the figs that grow on their property. 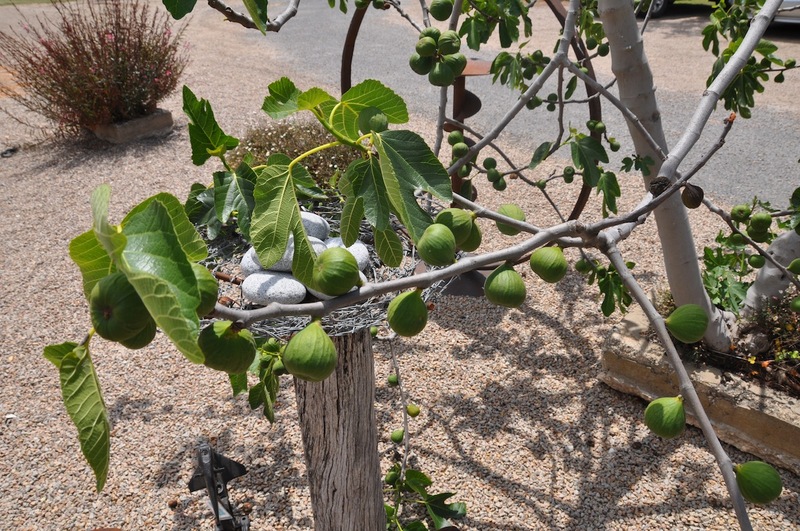 Oh, did we mention that people grow figs around here? FIGS! How cool is that...and we had someone point out to us one that is near our house that we can probably sneak in and pilfer some! Keeping with the trend, Dan chats and tastes while Lisa and our hosts stand at the door waiting for him to notice that it is time to go (Lisa edit: for the record, I did taste many wines, too… just not EVERY wine). And when he finally tore himself away (this time with a 6-pack and another membership) it was off to Jones winery. This was the smallest of the four, and makes only a few still wines along with some ports and muscats and topaques. The highlight here was port…so a bottle of that came home with us too (and yes, another club membership). We had planned on dining at Jones, but hadn’t gotten around to making a reservation; and, since it was hot and sunny, everyone was out in Rutherglen…they couldn’t seat us for another 2 hours! So we ended up at the Rutherglen wine tourism centre for lunch, which was surprisingly good for a tourist office. And there we also got to see the huge (HUGE!) variety of wines available in the area – easily a couple hundred different labels, all from within maybe a 20 mile radius. We missed a few wineries that we wanted to check out, such as Chambers Rosewood and All Saints. But we’ll get to those eventually. What we learned on this day out was that we don’t want to shop in Woolies and Liquorland any more. 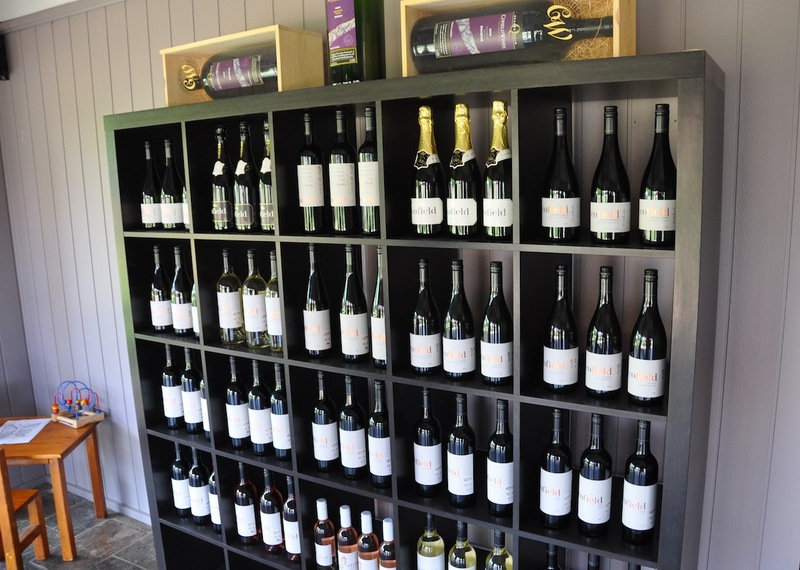 We would rather support the wineries directly, and it is so easy to do here (even around Wagga, there are a few wineries to visit; we’ll review those another time). And also, we won’t have to be doing too much shopping anyway, as all the memberships Dan signed up for include cases to be delivered at various times throughout the year. Lisa will need to hide his credit card very soon! And we came away with information about a lot of events in the Rutherglen…cycling weekends, wine dinners, etc. And recommend anyone thinking about visiting us ask about those dates before booking their flight/days off…it is a place not to be missed. This entry was posted in Australia, Canada, Corowa, Cowra, durif, Edmonton, muscat, Rutherglen, stickies, topaque, wine, wineries. Bookmark the permalink.